There are some public sector institutes which still command respect in India, and one of these is the office of the CAG - the Comptroller and Auditor General of India, which serves to curb and check financial malpractise in the government. This is why it saddens me to see how careless they have become. Here is an image from their recent report on Performance Audit of Empowerment of Women in the Government of Uttar Pradesh. This from a section of the report called Missing Daughters. 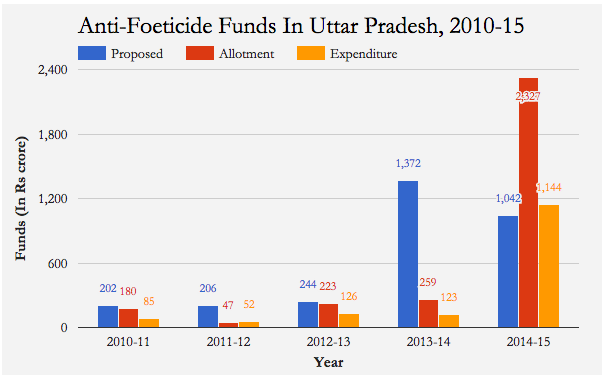 What are Anti-Foeticide Funds ? The word foeticide is emotionally charged, and every woman who has chosen to terminate a pregnancy has committed foeticide. This is legal and acceptable, because India respects reproductive autonomy and believes that a woman has the right and the power to choose for herself if she wants to terminate a pregnancy. When we send doctors to jail for not keeping clerical records properly under the PCPNDT Act, is it excusable for the CAG to commit such blunders ? Why is the CAG misusing and distorting words ?